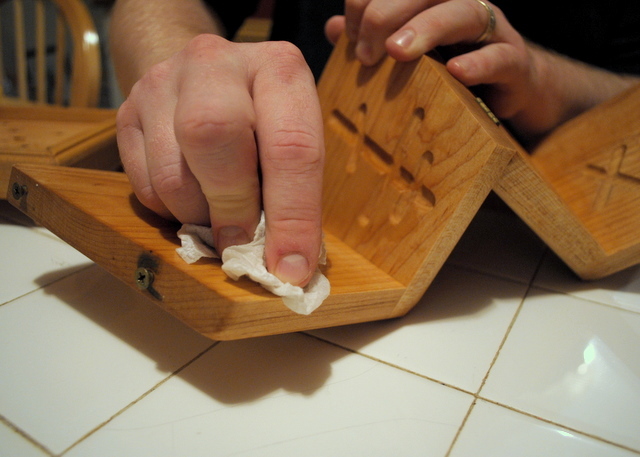 A few days in advance, clean and oil the cheese Pascha mold. 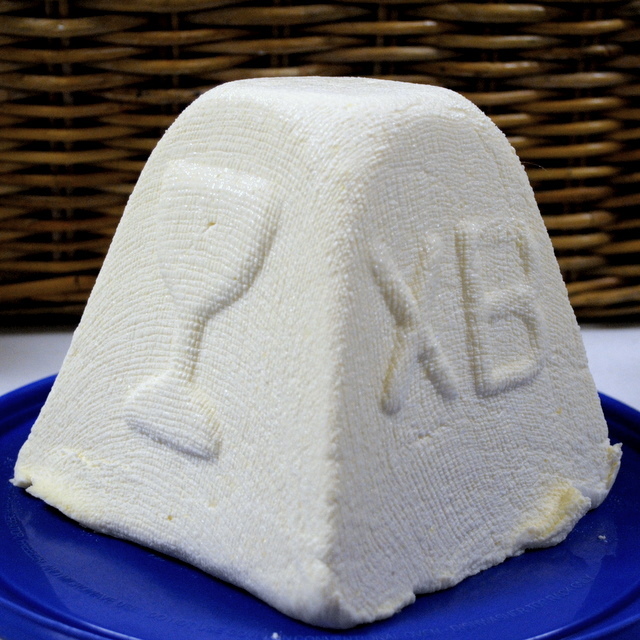 If you don’t have a fancy cheese Pascha mold like mine you can use a very clean plastic or terracotta flowerpot. 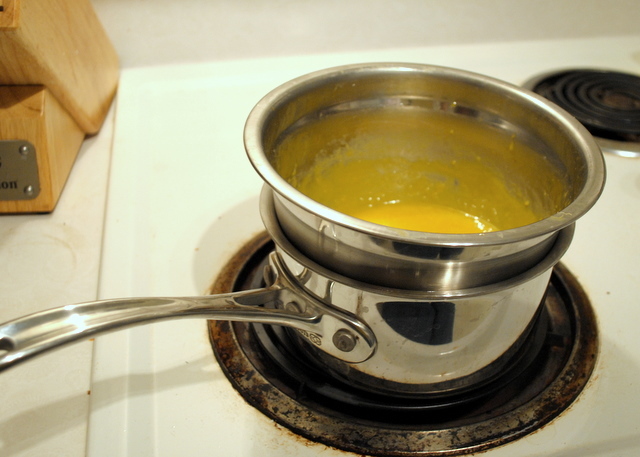 Using a double boiler, make a custard with 5 egg yolks, 2.5 Tablespoons of half and half, and 1/4 cup sugar. I use a bowl in a pot of simmering water. Let it cool slightly. Move your drained fromage blanc to a large bowl. I had hoped to measure out exactly 4 pounds but our kitchen scale is inexplicably missing. (Did you borrow it? We need it back!) I ended up using all of the cheese which was probably too much. 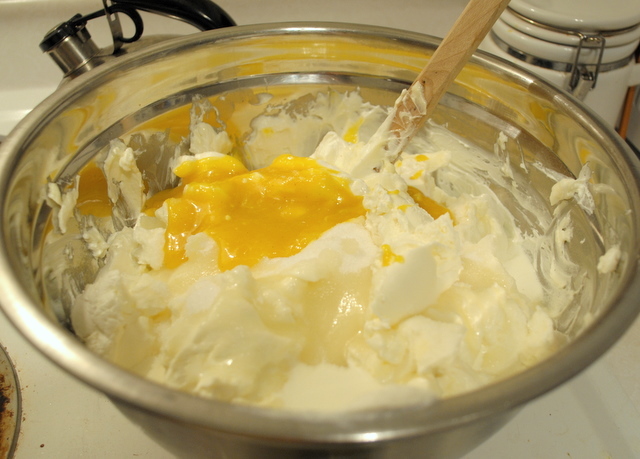 Add the custard to the fromage blanc and also add: 1/2 lb very soft butter, 1/4 cup whipping cream, 1/4 cup sour cream, and one more cup of sugar. I always have vanilla sugar made up in the pantry (put scraped vanilla bean pods into a container of sugar) so I use some of this in my cheese Pascha. If you don’t have vanilla sugar you can pour in vanilla extract. Start with 1/2 teaspoon and adjust to taste (or to smell if you’re not eating dairy while you make this). Stir well. 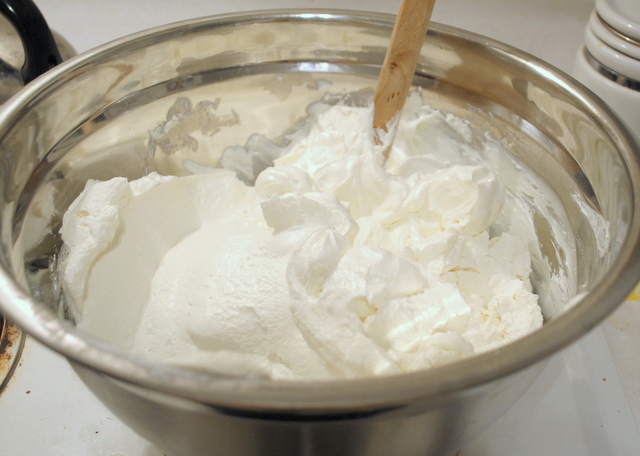 I sometimes need to use my hands to work in the butter and the sour cream depending on how soft they are. At this point my official taste tester lets me know if the batch needs anything. We added some salt and some more sugar to this one. When you are sure everything is perfect it is time to fill the mold. 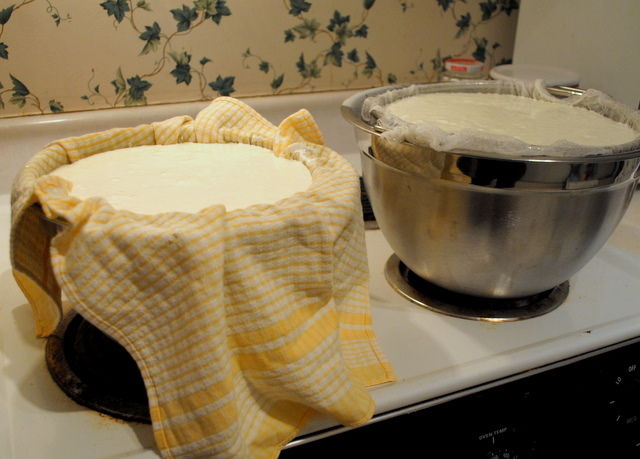 Place it in a bowl or on a shallow dish, line it with a double sheet of moistened cheesecloth, and fill to the very top. Your cheese will drain a few more days in the fridge, so don’t be afraid to really fill that mold. You can make a mini cheese Pascha with any leftovers (we had enough left over to make a whole second one). Put that baby in the fridge and monitor closely over the next day or so. You’ll need to empty your dish out before the sticky whey leaks out onto everything on your lower shelves. It will lose the most moisture in the first 12 or so hours (you can see in the photo that mine was already dripping when I took this picture). 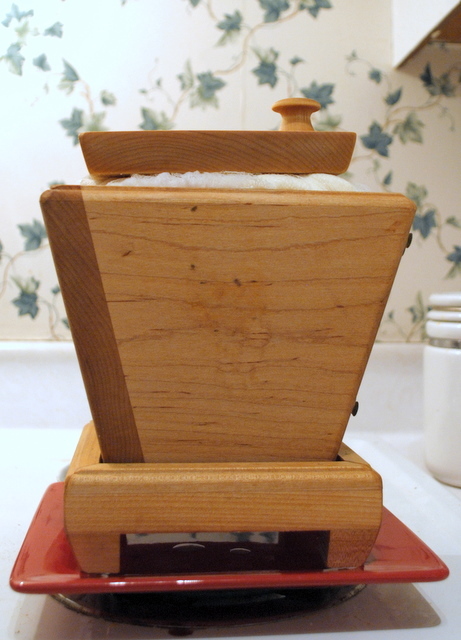 My cheese Pascha mold has a lid and that helps to weigh down the cheese. If you don’t have a lid you can use a plate or another flat item to help it drain. I pile it up with all sorts of random things by the time I’m done because there is nothing worse than a wet cheese Pascha that slumps when you take it out of the mold in front of its adoring crowd. We had four strainers going in total. The two on the stove were over bowls so we could keep some whey. The other two were in the sink. Straining the cheese at this point is very important. 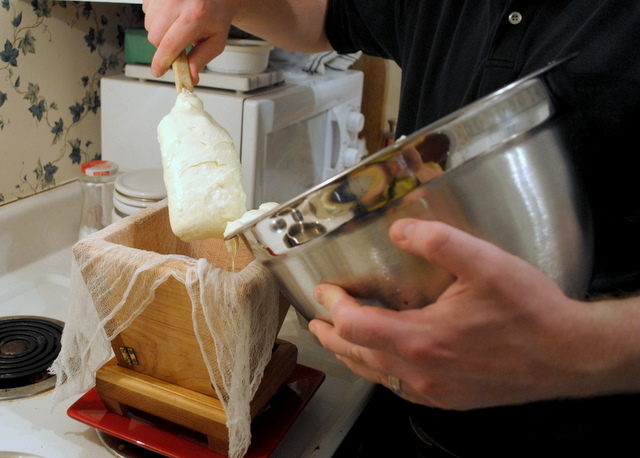 You’ll want your fromage blanc to get as dry as possible before you turn it into cheese Pascha because eventually you’ll want it to hold its shape. Drain it like this for as long as you can. The cheese lost a serious amount of whey! The half gallon jar you see there was from the bowl on the left. We figured that was enough and dumped the rest. The texture of the cheese at this point was like a good whipped cream or a very soft cream cheese. Because it had lost so much volume, and because I wanted it to be drier, I combined all four strainers into one and drained for another 12 hours. This time I weighted it down so it would drain more (sorry, no photos). Check back tomorrow as I add the ingredients to turn this plain cheese into cheese Pascha. The first ingredient in my cheese Pascha recipe is farmer’s cheese. During the 12 years that I have been making this dish the availability of commercial farmer’s cheese has varied. No two cheesemakers can even agree on what farmer’s cheese is. Eventually my husband, the homebrewer, realized that it would be easier for us to make our own rather than hunt through stores every year. 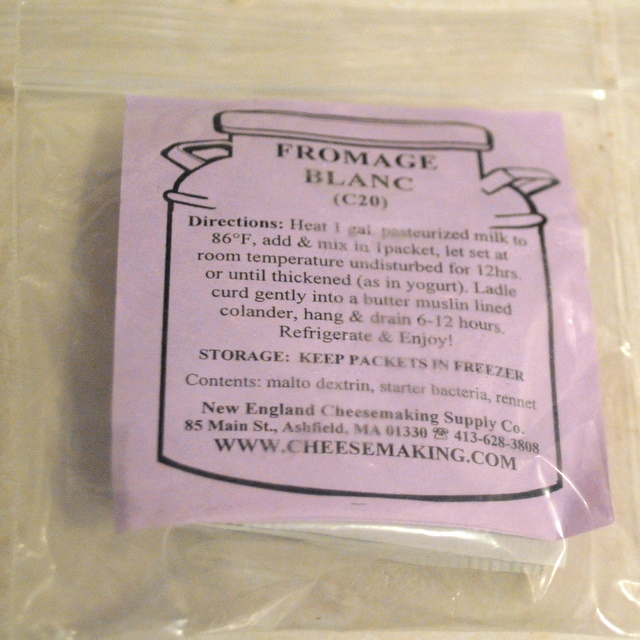 We settled on a culture from the New England Cheesemaking Supply Company (available for purchase locally at American Brewmaster) for a simple soft cheese called fromage blanc. 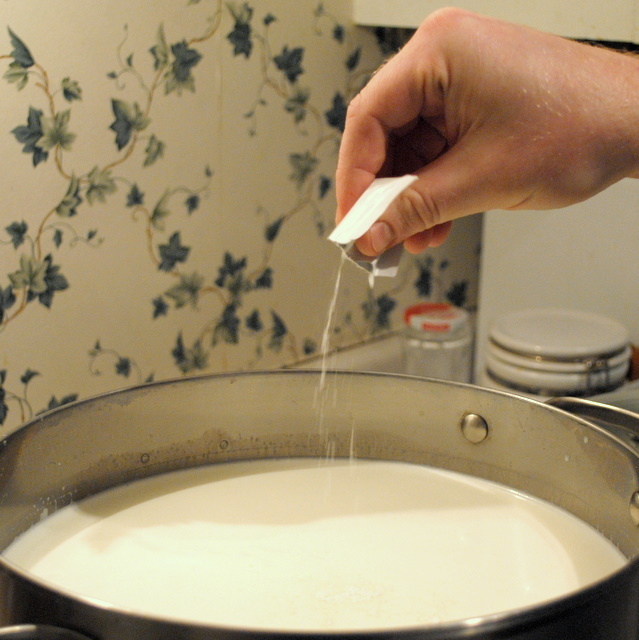 Making fromage blanc is simple: just add the culture to milk that is slightly warmer than room temperature, let sit, and drain. We started with four gallons of milk and four packets of culture to hopefully end up with the four pounds of farmer’s cheese I’ll need for my recipe. 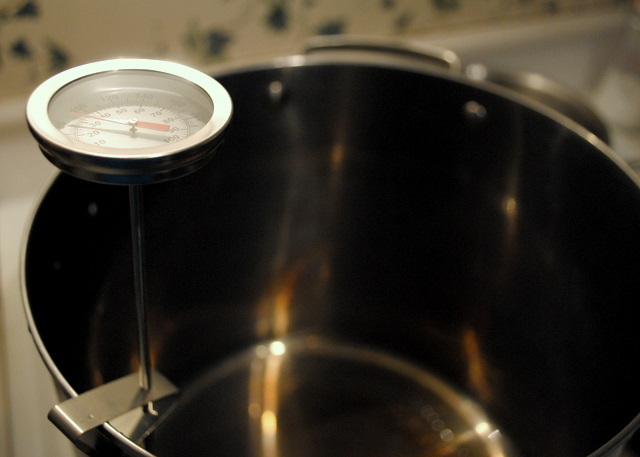 First we heated the milk to 86 degrees in two stockpots outfitted with thermometers. 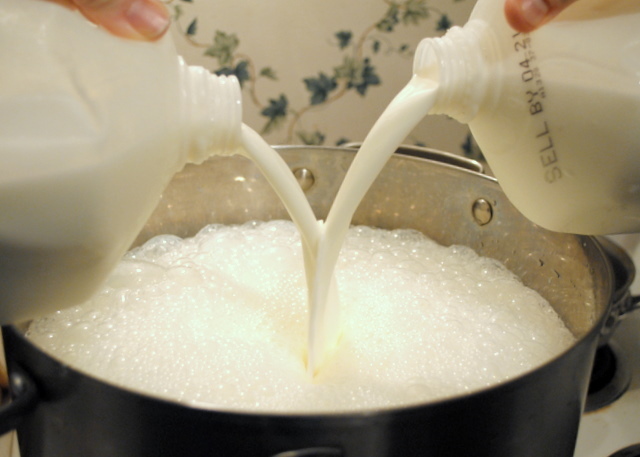 Then we added the culture to the warm milk and stirred it in thoroughly. 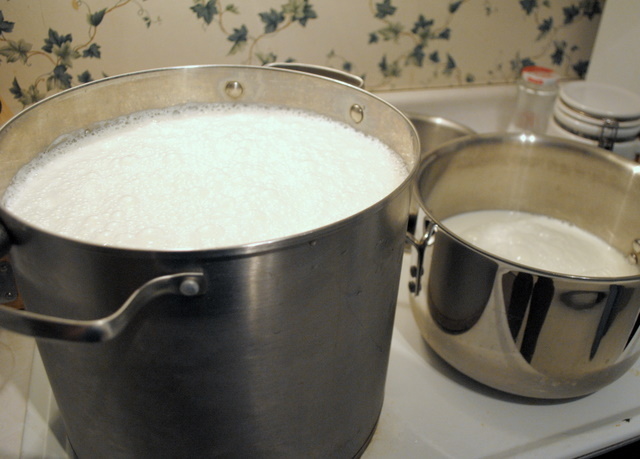 Now we let the milk sit overnight so the culture can work its magic. 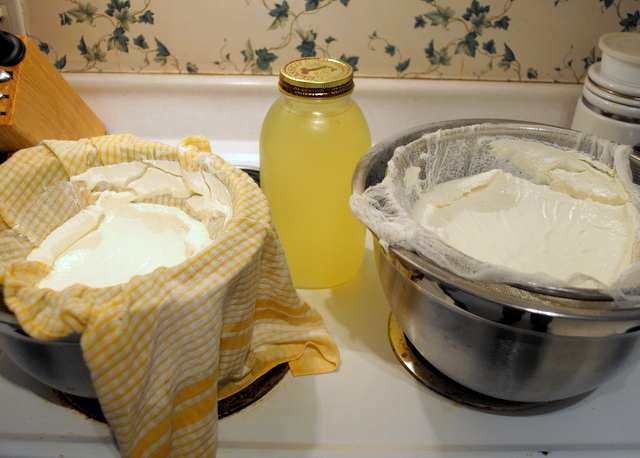 Unlike yogurt, fromage blanc doesn’t care so much what the overnight temperature of the milk is. We just left the covered pots out on the counter. Tomorrow: draining off the whey. This week I am going to show you how I make the traditional Russian Easter dish called cheese Pascha (Easter cheese). I am far from a traditional Russian, but I learned to make the dish from a Russian friend and have been following a recipe written by a Russian person so it’s probably pretty close. I even bought my cheese mold at a Russian monastery. My background is much closer to cooking than crafting so I almost hesitate to include this here. One of my goals for this 50 crafts project was to get out of the kitchen. However, this week is the craziest of my whole year and it seems appropriate to show you something I plan to do anyway. Plus, it’s awesome. This cheese won’t be unmolded until early Sunday morning so you’ll have to wait a bit longer for the final result. Come back tomorrow as we start at the very beginning: with milk. You are currently browsing the archives for the Cheesemaking category.